Peckinpaugh's legacy was in his organizational leadership, vision, promotional abilities, expertise in chairing major tournaments, and technical competence. Without his contributions, there would be a vastly different platform tennis landscape today in the Mid-Western Region as well as nationally. Walter Peckinpaugh made a significant impact on the growth of platform tennis across the country, particularly in the Mid-Western Region. As a player, he possessed speed and spin that made him a difficult individual to play against. His study of the competition and their strategies set him apart from others. In short, he maximized his talent, won numerous championships, and got better with age. However, his true legacy was in his organizational leadership, vision, promotional abilities, technical competence, and expertise in chairing major tournaments. Without his contributions, there would be a vastly different landscape today on the national platform tennis scene. 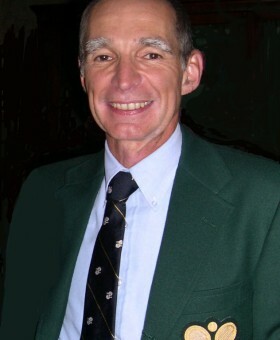 Peckinpaugh served on the APTA Board of Directors for 12 years in the 1980′s and 1990′s, and chaired the Nationals in Cleveland twice, in 1987 and 1993. He ran four National Seniors events, ten regional events, and countless local championships. Walt also set up the national APTA database to track memberships and fees. An entrepreneur, a fundraiser, a manager, a computer wizard, and a natural salesman and promoter, Peckinpaugh is a rare breed. A systems thinker, he brought innovative approaches to problem-solving, a Barnum and Bailey with computer firepower! And, Walt had the wisdom to partner with his bride, who was truly his secret weapon for success. His unique combination of skills, energy and passion almost guaranteed success at anything he tackled. One of his funding accomplishments for the APTA was convincing Arnold Dietri, the owner of Hedstrom, then the principle ball manufacturer, to raise the wholesale price of the ball by .10 and sending the money to the APTA. When asked by Arnie whether he would lose revenue, Walt replied that he would cover the “lost sales”. While Hedstom only agreed to do this for one year, the APTA received over $30,000, which Walt insisted be put into a reserve account to cover Life Memberships. After his induction in 2004, Walt continued to serve his sport by being an active member of the Hall of Fame selection committee.